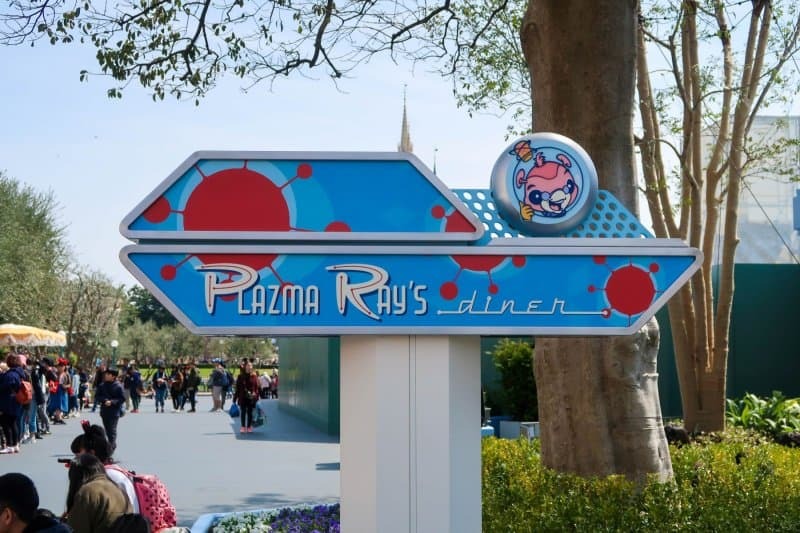 Plazma Ray’s Diner is a counter service restaurant in Tomorrowland at Tokyo Disneyland. It opened on March 25, 2017, which replaces the now closed Plaza Restaurant. 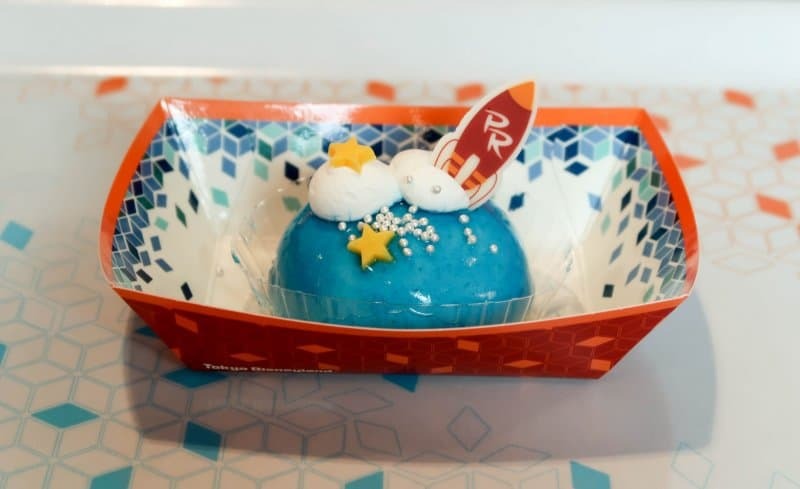 It offers four different rice bowls (which includes a vegetarian option), desserts, sweet potato fries, and a cute Mickey Egg spoon to buy! 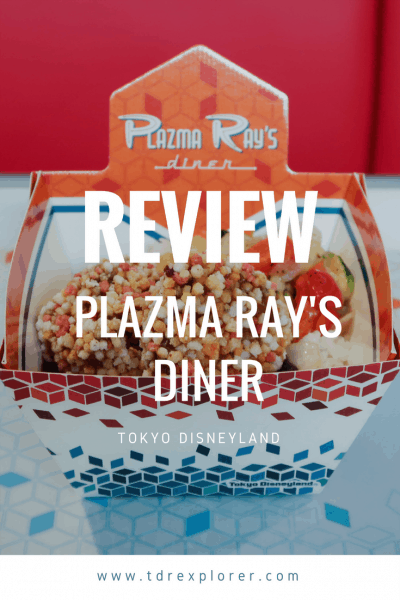 Here’s our review of Plazma Ray’s Diner and whether or not you should add it to your list of places to eat at Tokyo Disneyland! 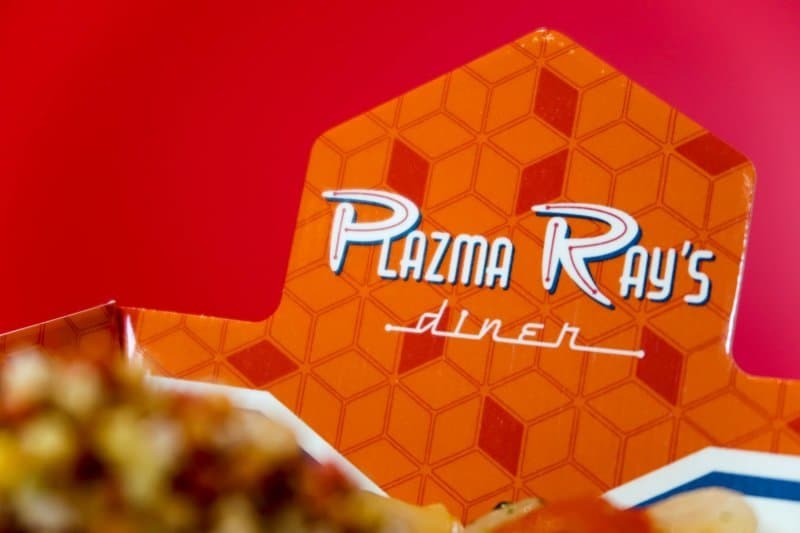 Plazma Ray is a small alien who owns a chain of restaurants named “Plazma Ray’s Diner” (which is well-known throughout the universe). 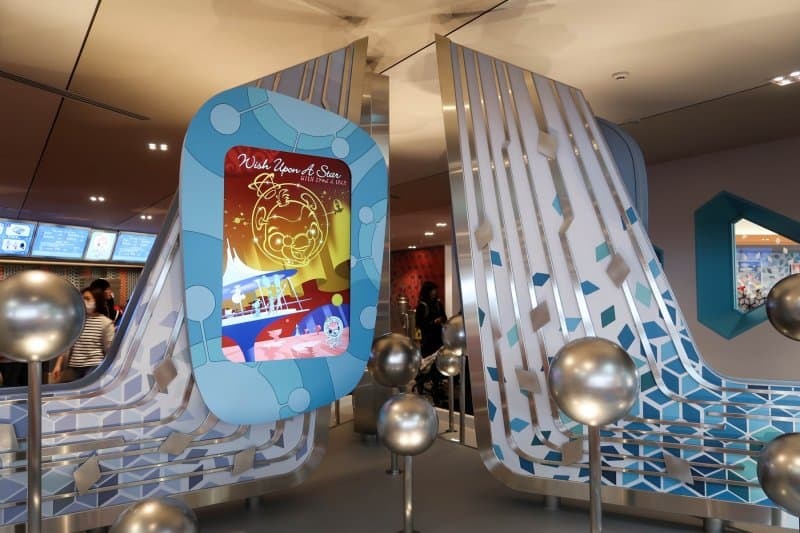 To expand his restaurant empire, he brings his restaurant to Earth for the first time in Tokyo Disneyland. In this casual setting, his delicious delicacies bring the most fun experience you can have in the galaxy. 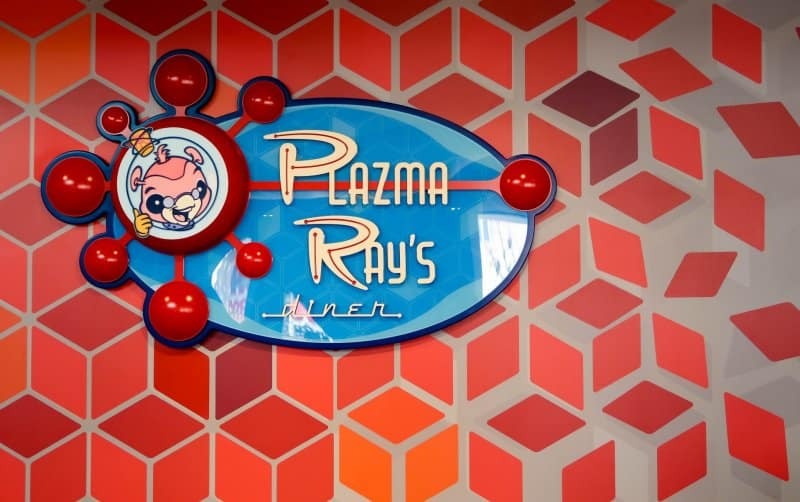 The decor inside Plazma Ray’s Diner is nothing more than a re-theming of the former Plaza Restaurant. 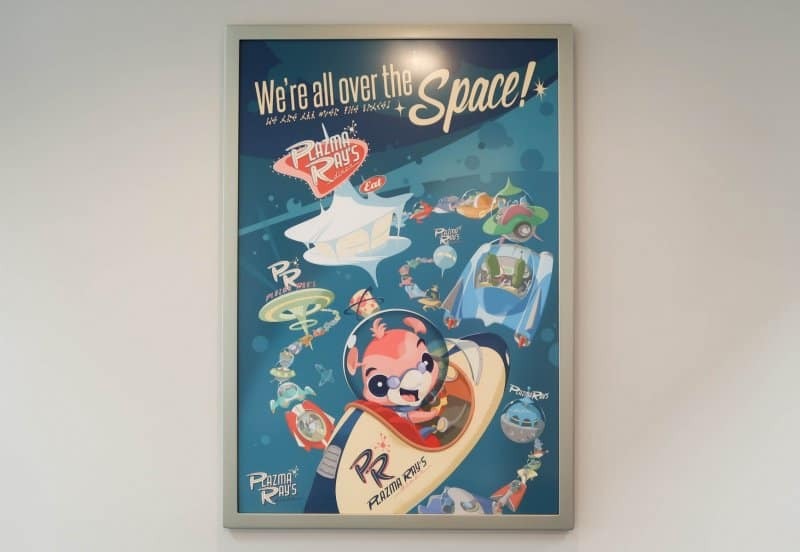 With an updated look, geometric patterns, and adorable artwork that plays along with the story of Plazma Ray (pay attention to the artwork as there are some hidden goodies for Stitch and Star Tours fans). 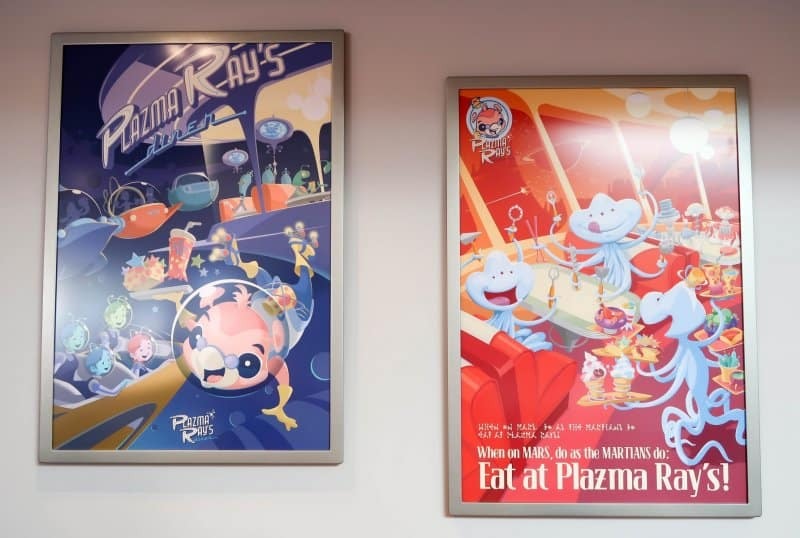 The simple decor is nice but other than the original artwork on the walls this restaurant doesn’t radiate much personality (outside of the Plazma Ray character). But, I have always found this with restaurants in Tomorrowland (Pan Galactic Pizza Port is the exception). Since this re-theme was done in just over 2-months, it’s hard to expect much more than that. If you look past this minor flaw, the geometric shapes are clean and pleasing to the eye. 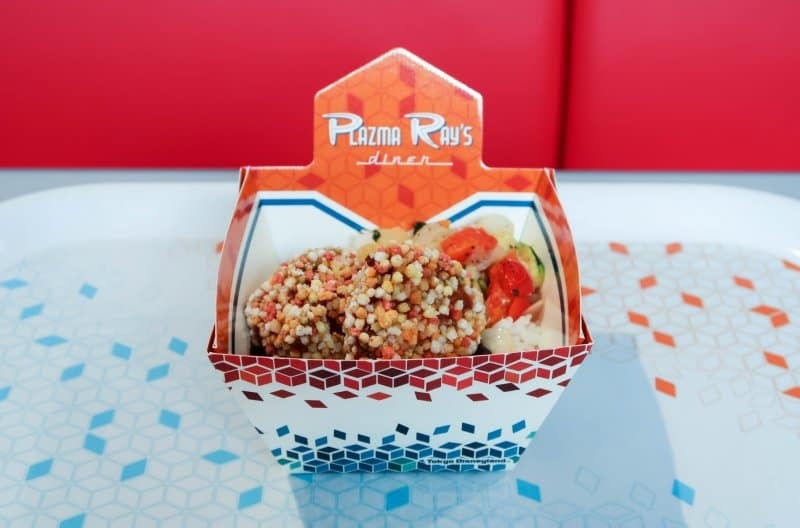 I love the food packaging and the serving trays, which are well designed. 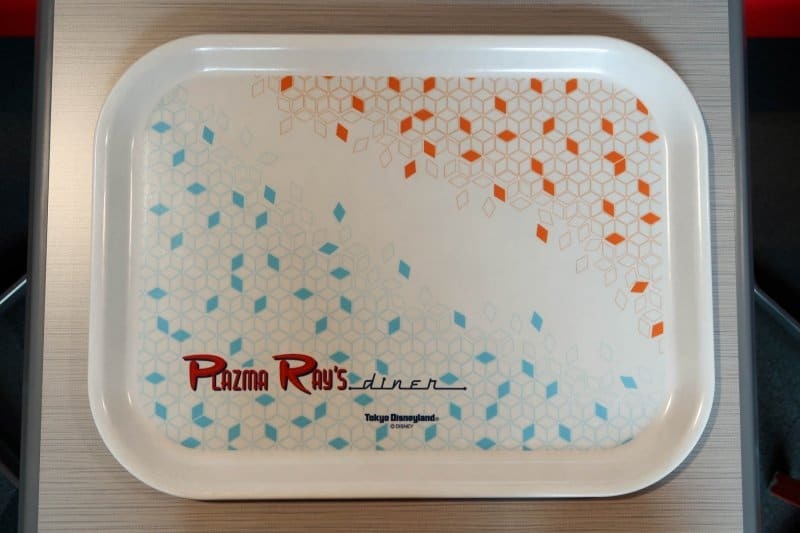 Let’s take moment and admire the beautiful trays. They are simple yet fits the geometric space-theme the restaurant dedicates itself to. 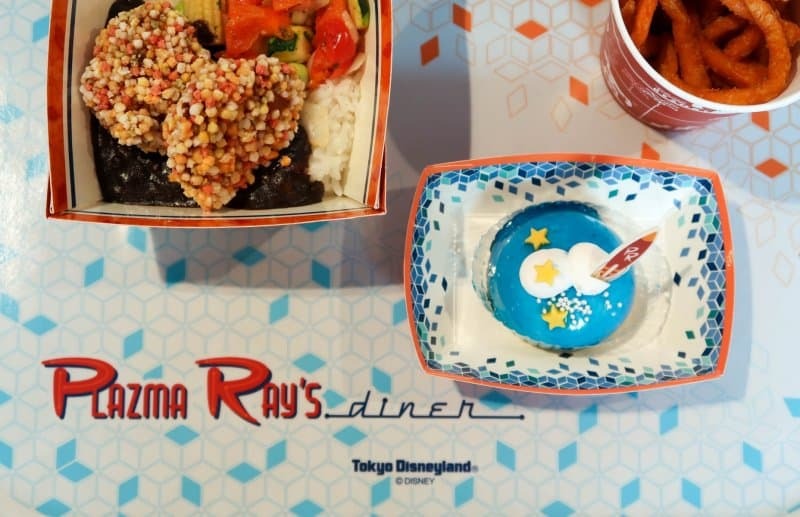 I have always been a fan of the restaurant specific trays Tokyo Disney Resort sticks to. There is background music to add to the atmosphere which was impossible to hear over the everyone in the restaurant. With the wide open seating arrangement, the chatter from guests drowned it out. From what I could hear, though, it had a “space” vibe to it. If it were up to me, I think a RetroWave playlist would fit quite nicely. You get to choose between four different rice bowls that include a hamburg (Salisbury steak), star-shaped deep-fried shrimp cutlet, arare chicken (deep-fried chicken covered with roasted mochi pieces), and a vegetarian bowl. All of which include rice and vegetables — zucchini, baby corn, edamame, red peppers, and tomatoes. You can order the individual bowls (¥780 or ~$7.50 USD) or the set (¥1,160 or ~$10 USD) which includes a small salad and choice of soft drink. Photos of the menu are at the bottom of this article. I ate the arare chicken and it didn’t disappoint. The roasted mochi pieces gave an added crunch to the juicy boneless chicken. Japan knows its fried chicken, and this was no exception. The rice, vegetables, and sauce bring it all together. The rice bowls in the former Plaza Restaurant were bland, so I went into this with low expectations and glad this rice bowl exceeded them. Also, the packaging is quite nice. A major thing to highlight is the vegetarian rice bowl (it’s even labeled as such). It has the vegetables listed above and is the only dish that has the adorable Mickey Egg. Note that this is not a vegan option since it contains egg and milk. It’s fantastic to see the resort making an effort to offer more vegetarian options. 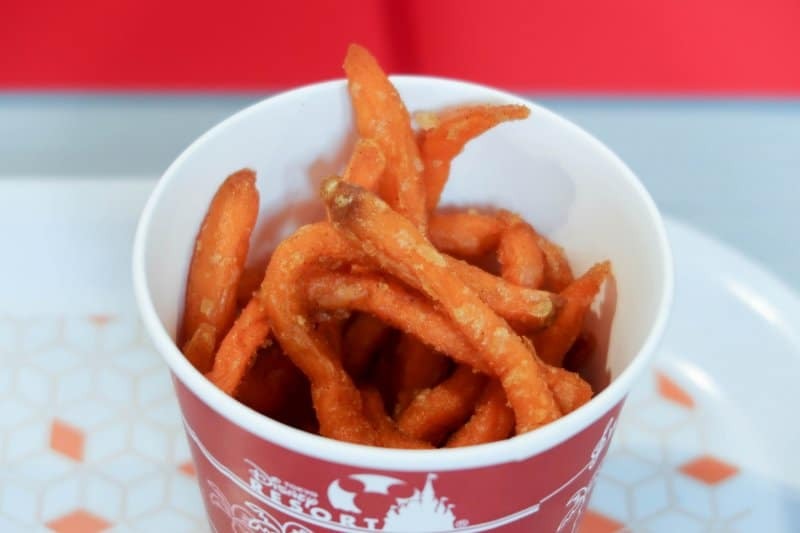 The sweet potato fries are a nice touch to add variety (¥290 or ~$2.50 USD). They were delicious, crunchy, and satisfied my craving — wish they had dill dip — and would get it again since they are uncommon in Japan. I would opt for these over normal french fries any day. 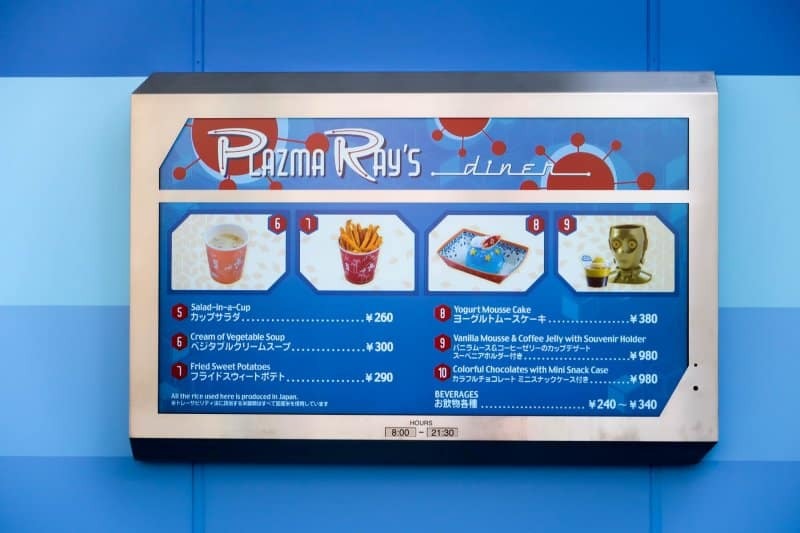 The only Plazma Ray’s Diner-themed dessert is the Yogurt Mousse Cake, which is blue with a rocket and stars on it. The mousse was — I think — raspberry and had another flavour on the inside. Honestly, it was so plain that I had a hard time identifying what the flavours actually were. They don’t say what it is on the menu and in my infinite wisdom, didn’t think to ask. While it wasn’t a terrible dessert, it just wasn’t memorable. The only thing going for it was the cute presentation. Most times, I’d recommend skipping the souvenir items at restaurants. But, the Mickey Egg spoon is too cute to pass up. With your order of a rice bowl, you can be one of the cool Tokyo kids for ¥500 (~$4 USD). 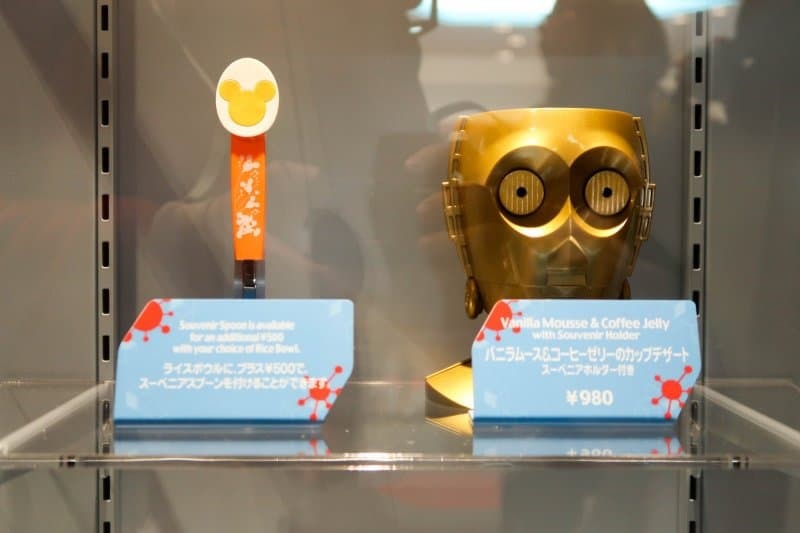 If you’re a fan of Star Wars they offer some of the souvenir items here too, which include the C3PO dessert and Darth Vader candy case. Skip the set meal which is just a salad and drink. Save money by refilling your water bottle at the water station or using the free paper cups. The salad isn’t anything special. Go for the rice bowls and sweet potato fries. It has ample indoor seating so it’s good to get out of the elements. There’s also outdoors seating. The Mickey Egg spoon is too cute to pass up. One of the few locations in Tokyo Disneyland that offer a vegetarian option. They offer pressed pennies (souvenir medallions) with Big Hero 6 characters on them near the seating areas. The restaurant is not fully complete, the rest of the seating opens in Summer 2017. The decor is a simple refresh of the Plaza Restaurant with a cute story. I am glad they added an original story (even as simple as it is), which opens the possibilities to have the story continue over at the Tomorrowland Terrace. Whenever they decide to re-vamp it. 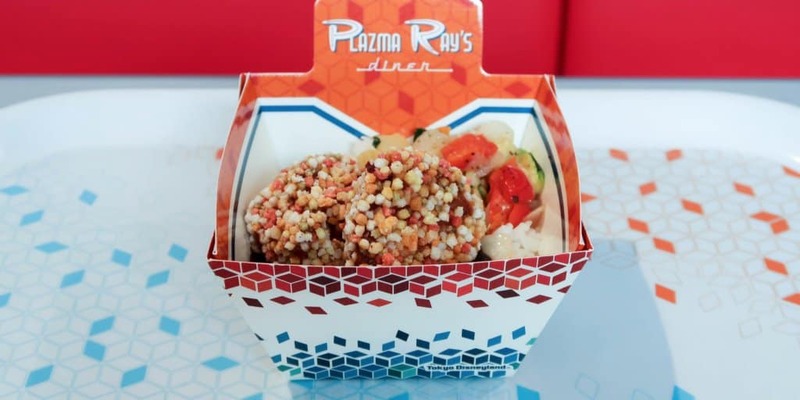 The food is an improvement to the rice bowls the Plaza Restaurant offered before. 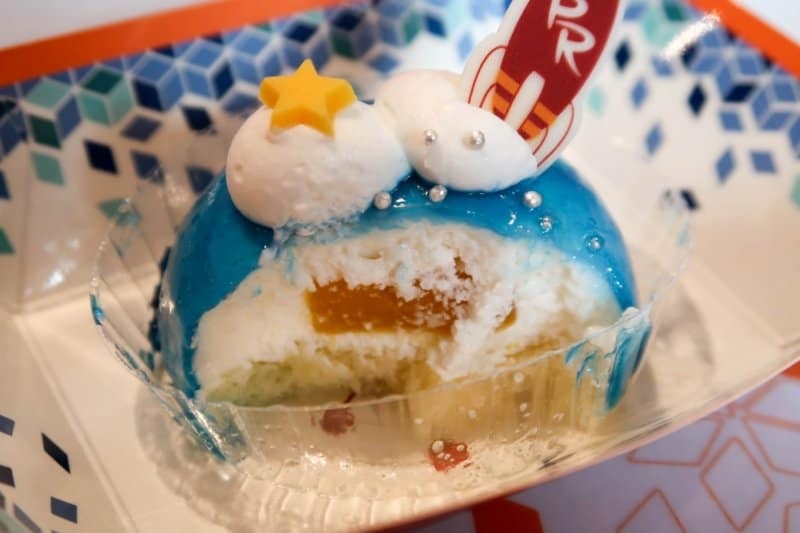 While there are better options (Hungry Bear Restaurant, Camp Woodchuck Kitchen, and Grandma Sara’s Kitchen to name a few), it’s a great addition to the food options at Tokyo Disneyland. The choice of a “healthier” meal is always welcomed (including vegetarian). 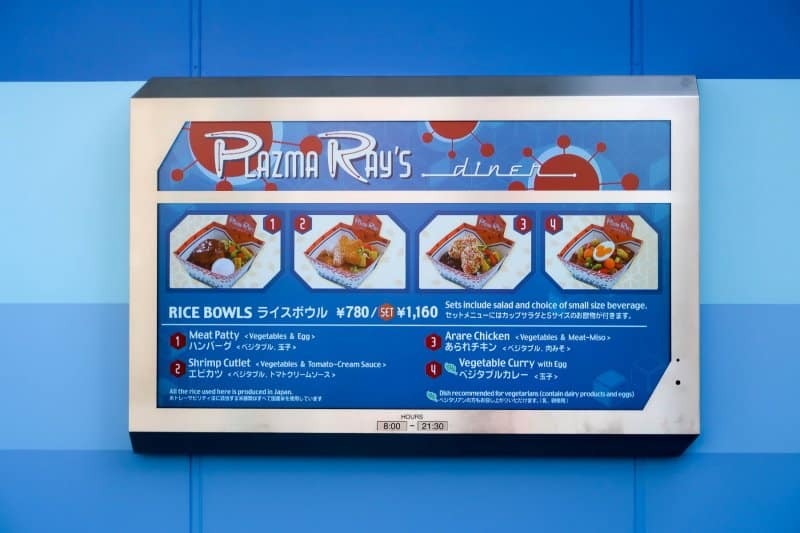 If you’re in the mood for a delicious rice bowl in a comfortable environment with eye pleasing geometric decor, then you’ll have to make time for Plazma Ray’s Diner at Tokyo Disneyland. 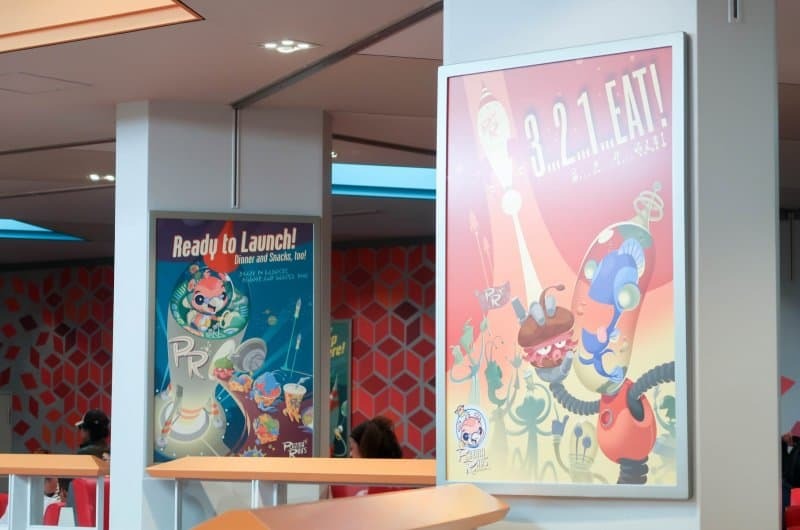 It doesn’t sound like it warrants an addition to my list of restaurants for an upcoming trip, but it also doesn’t sound like a terrible last minute option if hunger strikes while in Tomorrowland. I’m looking forward to the completion of your current Shanghai Disney trip report. I really want to know what restaurants are worthy of a visit, other than Barbossa’s Bounty! I am not sure what they cook with, they don’t say. You’ll have to ask at Guest Relations (to make sure you get someone who understands English).